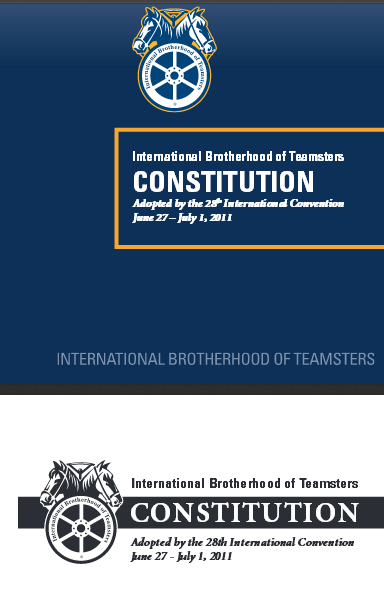 The Consent Decree entered on March 14, 1989, in United States v. International Brotherhood of Teamsters, et al., 88 Civ. 4486 (S. D. N. Y.) (LAP), made certain amendments to the International Union’s Constitution that the courts have held are part of the Constitution despite the fact that they were rejected by the delegates to the 1991 International Convention. The following Constitution includes Article XIX, Section 14, which is required by the Consent Decree. Language required by the Consent Decree but not approved by the delegates is printed in ITALICS. Those provisions are currently in effect. The International Union will notify you of any changes resulting from court or governmental action.